Whether it’s pre-JazzFest anticipation or something else, New Orleans feels like it’s on an emotional upswing. Mitch Landrieu, stepping down as Lt Governor and being sworn in as the city’s new mayor in less than two weeks, is listening to citizens and putting together his staff; Landrieu, voted in with strong support from blacks and whites alike, is one of the good guys, a vocal proponent of the arts economy. Saints pride is still in full springtime bloom, with residents and visitors alike contiuing to revel over the end of the “Ain’ts” era, as a billboard near the SuperDome points out. “Treme,” David Simon’s superb new HBO series, focused on the lives of musicians and others in New Orleans, just after the storm, is the talk of the city, and the nation. The 41st annual New Orleans Jazz and Heritage Festival kicks off tomorrow, following a successful French Quarter fest. And then there’s this: Real jazz is back on Bourbon Street. 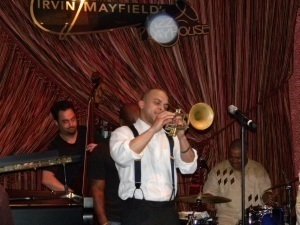 Wednesday night, trumpeter Irvin Mayfield celebrated the one-year anniversary of his Jazz Playhouse. It’s a plush nightclub inside the Royal Sonesta on Bourbon Street, a place, filled with the sounds of straight-ahead jazz (bebop, modern, post-bop, whatever you want to call it) and trad jazz. Mayfield celebrated the occasion with a long evening’s worth of performances and jam sessions, in collaboration with the guys from his New Orleans Jazz Orchestra, and special guest trumpeter Kermit Ruffins (who plays himself on “Treme”). The show was such a success that at one point potential patrons couldn’t get in. Shortly later, joined by a group including saxophonist Aaron Fletcher, he offered a long, rousing medley, with “This Little Light of Mine” segueing into “The Battle Hymn of the Republic,” “I’ll Fly Away,” “The Saints Go Marching In” and “We’re Gonna Second Line.” Along the way, he engaged the cheering, singing, fired-up crowd in the Saints’ “Who Dat?” chant. Earlier in the evening, at a reception honoring the club’s anniversary, Mayfield and his partners in the club, as well as pianist David Torkanowsky, talked about the significance of the Jazz Playhouse. 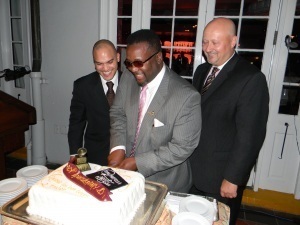 Also on hand for the reception was Wendell Pierce, AKA trombone player Antoine Batiste on “Treme.” He helped cut the cake (see pic) and added a bit of celebrity to the proceedings. In town for Jazz Fest? The Jazz Playhouse offers a long list of great shows over the next 10 days or so, including shows feturing Mayfield, Torkanowsky, pianist Ellis Marsalis, drummer Jason Marsalis, singer Johnaye Kendrick, fiddler Amanda Shaw, Bob French and the Original Tuxedo Jazz Band, and tributes to Danny Barker. For more information go to Mayfield’s site or the Royal Sonesta site.